A nice ride discovering the south west coast of Sardinia: the Costa Verde. 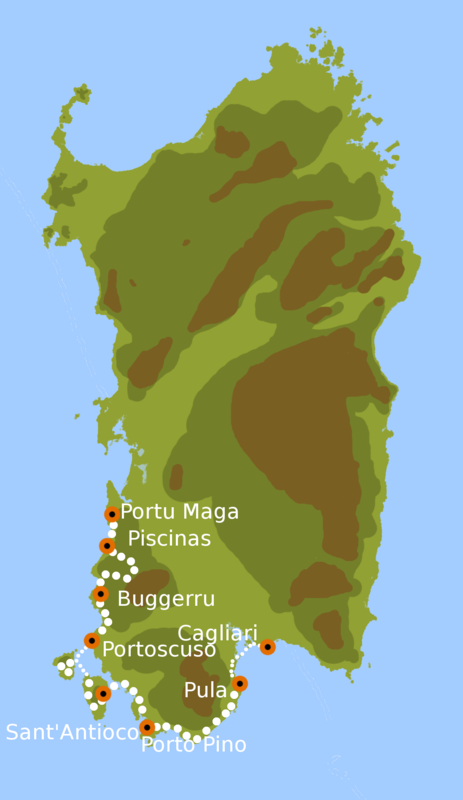 Forget the big tourist resorts, this area of Sardinia is still totally intact and keeps the marks of the mining economy, flourishing until a few decades ago. In the second part of the tour we will ride in the two islands, San Pietro and Sant'Antioco, with their fishing traditions, and in the fabulous South Coast, famous for its beaches. The last evening we'll be in Cagliari for a shopping session and the celebration dinner. We can warm up and test bikes in the afternoon going to discover the famous dune of Piscinas Beach, one of the largest of Europe, visible even by satellite. Two option for today, both nice and scenic through the Sardinia mining history. The first one, of about 50 Km, leave Portu Maga to climb toward the "phantom" village of Montevecchio, an UNESCO Geo-Park. Here you can feel the history of this area of Sardinia. Then you'll pedal gently till the Passo Bidderdi where a fantastic downhill bring you to the mine village of Buggerru. The second option, 10 Km shorter, is to take the climb to Ingurtosu instead of the Montevecchio one. Harder that the first one, it give you the chance to pedal between the ancien gears and buildings of one of the main mines of Sardinia. Big climb today as a day start... But then, 2 beautiful downhills with sea view till the beach of Funtanamare are waiting for you. We'll reach then the village of Porto Scuso for an Ice Cream and then 25 km of a flat road to reach the island of Sant'Antioco, connected to Sardinia main land by a bridge since the Roman Empire epoc. The downtown of this pretty fishermans village, rich of traditions, will be the place of our dinner. Today we'll spend our rides discovering the 2 islands of south Sardinia. We'll start with the loop of San Pietro island, then, after 30 minutes by ferry, we'll ride the loop of Sant'Antioco island, our final destination for today. We leave Sant’Antioco island along the salt works, dotted by pink flamingos. After a stop in the picturesque village of Tratalias vecchia, built around the beautiful Romanesque Cathedral of Santa Maria, we’ll cross the Sulcis countryside through artichokes fields and Carignano vineyards. The riding day ends in Teulada in a Agriturismo (holiday farm) where we'll have the chance to taste the typical Sardinian Dinner. 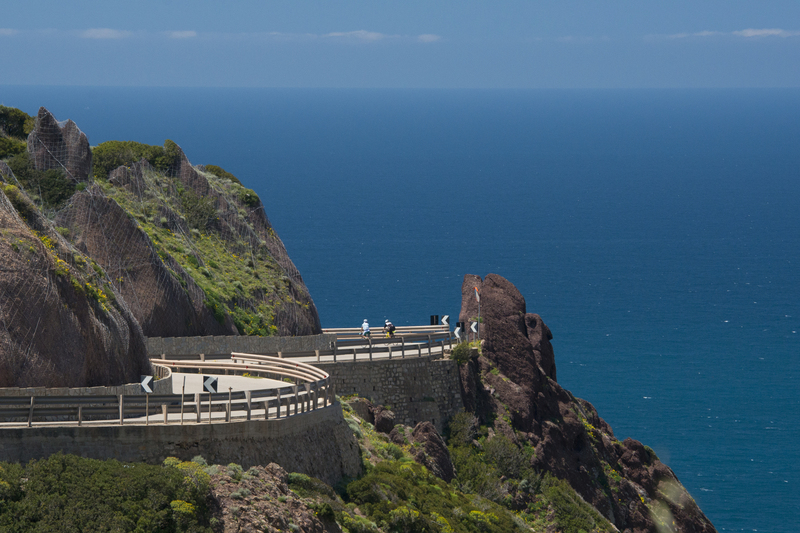 The last leg of our tour starts with a rolling part overlooking Capo Teulada shores, this is just a warm up which make you ready to face the highlight of your tour: the amazing Costa del Sud. It’s a little bit challenging road, going up and down along the coast...a little pain for your muscles but a joy for your eyes. We end in Pula, a lively town and the perfect place to celebrating before the tranfer to Cagliari for the final dinner downtown. It’s time to say goodbye, we really hope to see you again! But, depending of your return flight time, you can enjoy either a tour of the famous San Benedetto market or a short ride by bike between sea and pink flamingoes. The price of this Tour starts from 1.090 €, and it's fully customizable.